To ensure greater efficiency – and to protect your profits – Phillips Precision will help you design inspection setups using Inspection Arsenal™. 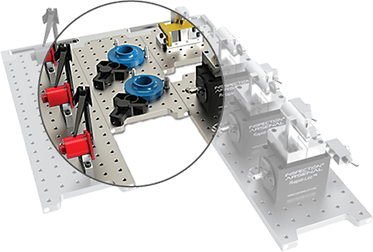 And while Inspection Arsenal™ is a universal system, we can also custom design the perfect workholding components for your parts. Any designs created will be shared for your approval. Special marking, barcoding, or part numbers added to fixtures. 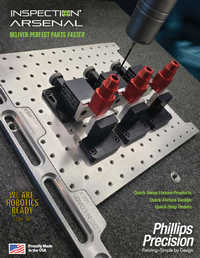 Thank you for your interest in Phillips Precision’s fixture design services. In order to create the most efficient service to you, we ask that you complete the attached request form. Please accompany this form with the prints and electronic files that will help us understand your needs. As soon as we receive this information, we will call you to review the details of the project. A design concept fee is also required prior to the start of the project. This will be determined at the time the form and files have been received. If the project is awarded, this up-front fee will be deducted from the final invoice. Project scope must be detailed in writing and Phillips Precision will ask for approvals throughout the design process. A not-to-exceed project cost can be determined in order to initiate the project purchase order. Custom fixture projects are non-refundable. Alterations after final approval will be billed out at the current Phillips Precision shop rate. Phillips Precision, Inc. does not perform gage R&R studies on fixtures it designs for customers. This is the sole responsibility of the customer, unless specifically requested by customer and quoted as part of the initial work.